The holiday season is here and with it comes the best time of year. Vintage Dean Martin, Bing Crosby, and Ella Fitzgerald are crooning on a loop and the home aroma of cinnamon is perpetually drifting in the air. For the next month, my husband will frequently return home from work with crinkling new goody bags that people kindly bestowed upon us. In turn, he’ll leave the house the following morning with his hands full of our own edible offerings to distribute. It’s wonderful. For a glorious 25 days the holiday cheer makes life seem brighter and more merry. Whether a Scrooge or a Buddy-The-Elf, the festive window displays and festooned streets (along with the constant appearance of seasonal desserts) has to bring one even the slightest joy. Along with the holiday season comes winter. It’s finally beginning to reveal more of itself in these rainy days and frozen nights. Snow is just around the corner and it can’t come soon enough. Memories of waking to white blankets of snow and the crunch of snowy footsteps fills me with joy. The sound of utter stillness and quiet as the snow falls is one life’s most beautiful experiences. Living in the Midwest ensures snow at some point, but it’s Christmas snow that’s the most special. The one that falls before December 25th. The one where the city shuts down and when you wake in the morning you have no where to go. It’s just you, the ones you love (cats + husband), a hot cup of coffee (this could also qualify as “the one you love”), and a lazy morning full of relaxation. If one is lucky, there will be time to make a batch of cookies. While every one else was stocking up on bread and milk to tide them over in a snowstorm, your basket included eggs, flour, butter, and milk. 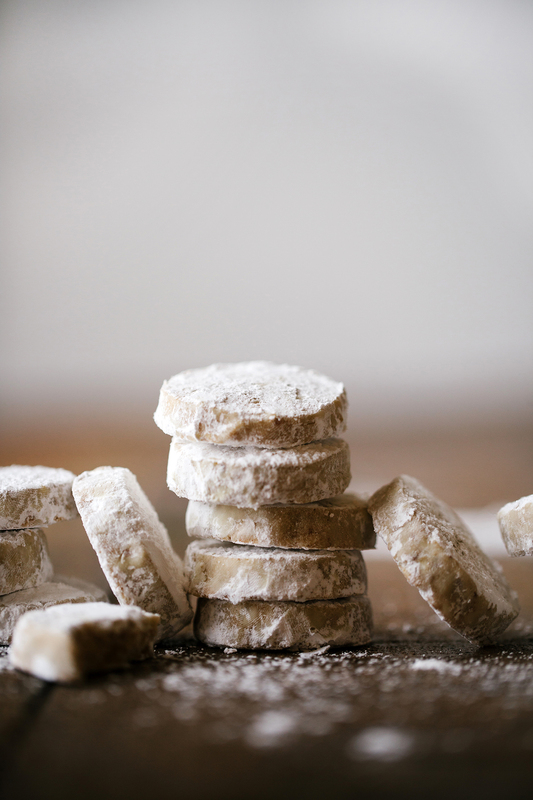 The perfect snow-storm cookie: Chestnut Snow Cookies. They’re a variation of the pecan Russian Tea Cakes (or Russian Tea Cookies, Mexican Wedding Cookies, or Swedish Tea Cakes- whatever you wish to call them) and made instead with roasted chestnuts. 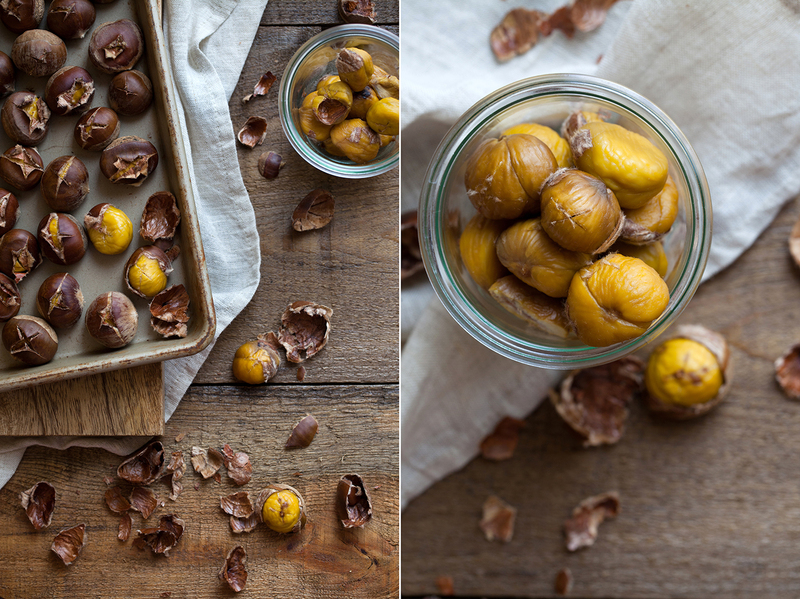 The fresh chestnuts provide an extra butteriness and creaminess to the flavor. Plus, it’s fun to roast chestnuts this time of year. The tune of “chestnuts roasting on an open fire” comes to mind. 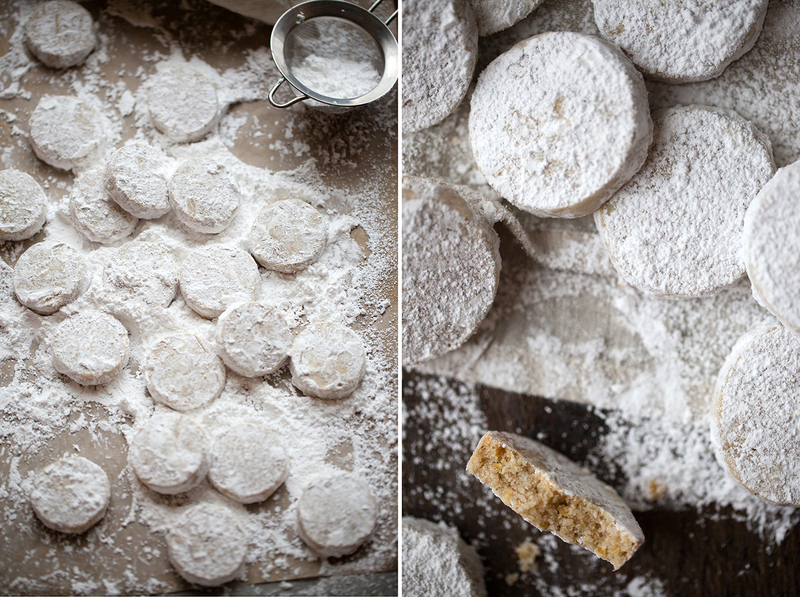 Food good measure and extra “snowiness” they are rolled in powdered sugar twice. 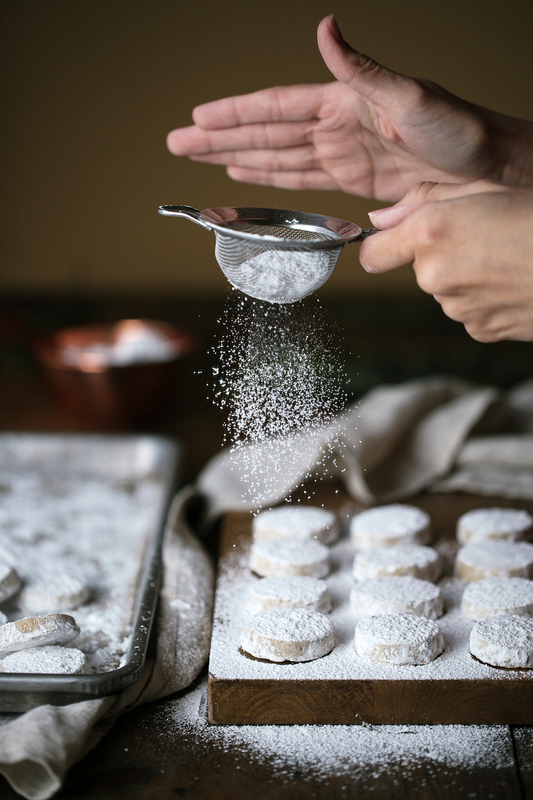 If you prefer a lighter touch of sugar, just give them a good dusting with a sifter. After you’ve dug yourself out from under all that snow, they make for a nice gift to share with others. This holiday season, I wish you many cookies and maybe just one really good snow storm. Mostly cookies though. Preheat oven to 450F. With a sharp knife, cut a small “x” into the top of each chestnut. Be sure to cut through the shell so it’ll peel back nicely while roasting (this makes peeling the nuts easier). Place nuts on baking sheet and roast for 20 minutes. Remove from oven and let cool completely. Once cool, peel off shells. 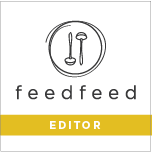 Coarsely chop chestnuts and place into a food processor. Grind chestnuts until fine. Add flour, granulated sugar, cinnamon, and salt. Pulse several times to combine ingredients. Add soft butter and pulse until combined and dough forms. Pour dough out onto a clean work surface. Shape dough into a 1″ thick log by rolling it back-and-forth under both hands until smooth and evenly distributed. Wrap log in plastic wrap and freeze for at least 1 hour or overnight. Dough can be stored in freezer, wrapped, for up to two weeks until ready to use. Preheat oven to 325F. Remove frozen dough log from freezer and let thaw for 5 minutes on counter. On a cutting board, with a sharp knife, cut log into 1/2-inch slices. Arrange slices on a parchment-lined baking sheet, spacing 1-inch apart. Bake for 22-25 minutes until edges are lightly golden brown. Remove from oven and place on cooling rack. Let cool completely. 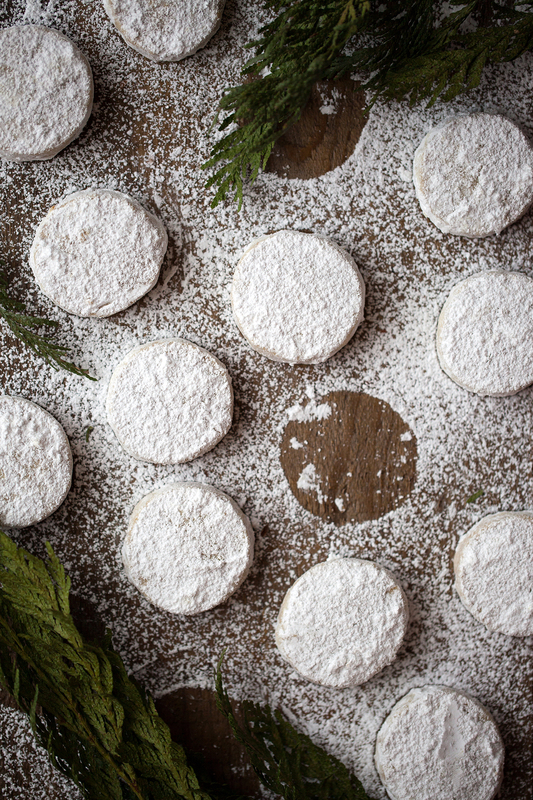 Place powdered sugar in a bowl and gently roll in each cookie until coated. Roll cookies in sugar a second time. Tap off excess and serve. Store any remaining cookies in an airtight container for up to 1 week.